Thank you very much; I will see you next Friday at 10 am. 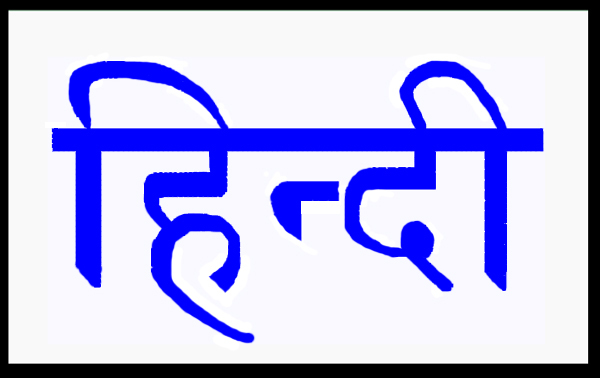 Hindi, or more precisely Modern Standard Hindi, is a standardised and Sanskritised register of the Hindustani language (Hindi-Urdu). Hindustani is the native language of people living in Delhi, Haryana, Western Uttar Pradesh, Bihar, northeastern Madhya Pradesh, and parts of eastern Rajasthan, and Hindi is one of the official languages of India. Colloquial Hindi is mutually intelligible with another register of Hindustani, (Modern Standard) Urdu, which is associated with the Muslim religion. The two varieties of Hindustani are nearly identical in basic structure and grammar, and at a colloquial level also in vocabulary and phonology. Mutual intelligibility decreases in literary and specialised contexts, which rely on educated vocabulary drawn from different sources; Hindi drawing its specialised vocabulary from Sanskrit, whilst Urdu does so from Persian and Arabic. People who identify as native speakers of Hindi include not only speakers of Hindustani who are Hindu, but also many speakers of related languages who consider their speech to be a dialect of Hindi. In the 2001 Indian census, 258 million people in India reported Hindi to be their native language; as of 2009, the best figure Ethnologue could find for speakers of actual Hindustani Hindi (effectively Khariboli dialect less Urdu) was a 1991 figure of 180 million. 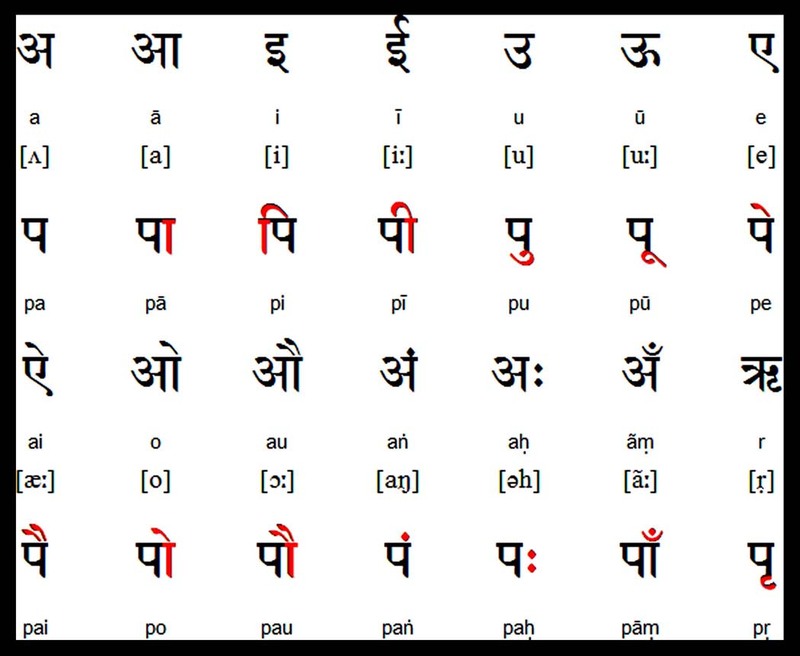 This makes Hindi approximately the sixth-largest language in the world. The Indian constitution, adopted in 1950, declares Hindi shall be written in the Devanagari script and will be the official language of the Federal Government of India. However, English continues to be used as an official language along with Hindi. Hindi is also enumerated as one of the twenty-two languages of the Eighth Schedule of the Constitution of India, which entitles it to representation on the Official Language Commission. The Constitution of India has effectively instituted the usage of Hindi and English as the two languages of communication for the Union Government. Most government documentation is prepared in three languages: English, Hindi, and the primary official language of the local state, if it is not Hindi or English. The Constituent Assembly adopted Hindi as the Official Language of theUnionon 14 September 1949. Hence it is celebrated as Hindi Day. In the year 1881 Bihar accepted Hindi as its sole official language replacing Urdu and thus became the first state ofIndia to adopt Hindi. The Dwivedi Yug (“Age of Dwivedi”) in Hindi literature lasted from 1900 to 1918. It is named after Mahavir Prasad Dwivedi, who played a major role in establishing the Modern Hindi language in poetry and broadening the acceptable subjects of Hindi poetry from the traditional ones of religion and romantic love. In the 20th century, Hindi literature saw a romantic upsurge. This is known as Chhayavaad (shadowism) and the literary figures belonging to this school are known as Chhayavaadi. Jaishankar Prasad, Suryakant Tripathi ‘Nirala’, Mahadevi Varma and Sumitranandan Pant, are the four major Chhayavaadi poets. 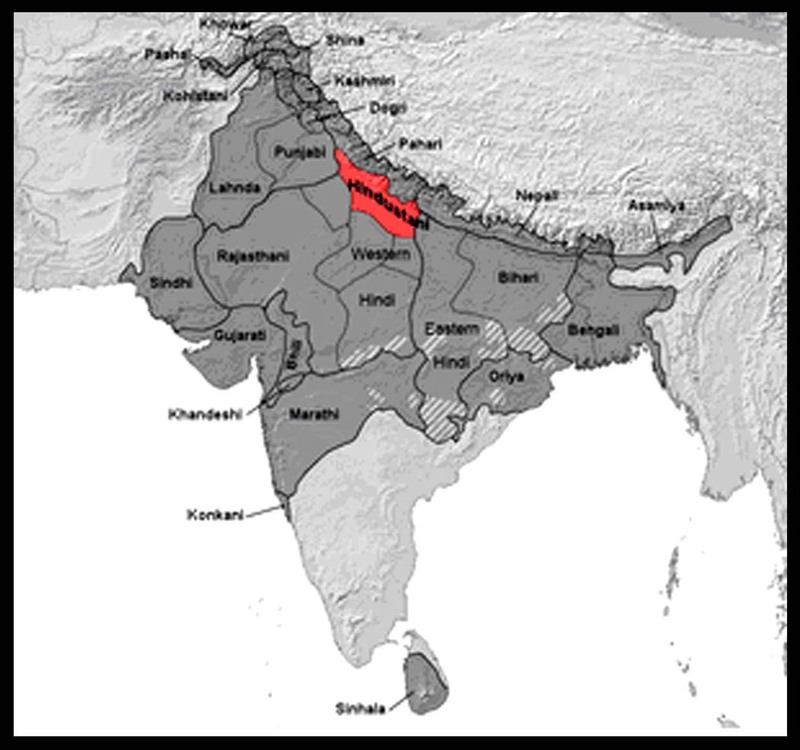 Hindi is an Indo-Aryan language with about 487 million speakers. It is one of the official languages of India and is the main language used in the northern states of Rajasthan, Delhi, Haryana, Uttarakhand, Uttar Pradesh, Madhya Pradesh, Chhattisgarh, Himachal Pradesh, Jharkhand and Bihar, and is spoken in much of north and central India alongside other languages such as Punjabi, Gujarati, Marathi or Bengali. In other parts ofIndia, as well as inNepal,BangladeshandPakistan, Hindi is understood. InFijipeople of Indian origin speak Hindi, and in some areas the Fijian people also speak it. Hindi is closely related to Urdu, the main language of Pakistan, which is written with the Arabic script, and linguists consider Standard Hindi and Standard Urdu to be different formal registers both derived from the Khari Boli dialect, which is also known as Hindustani. 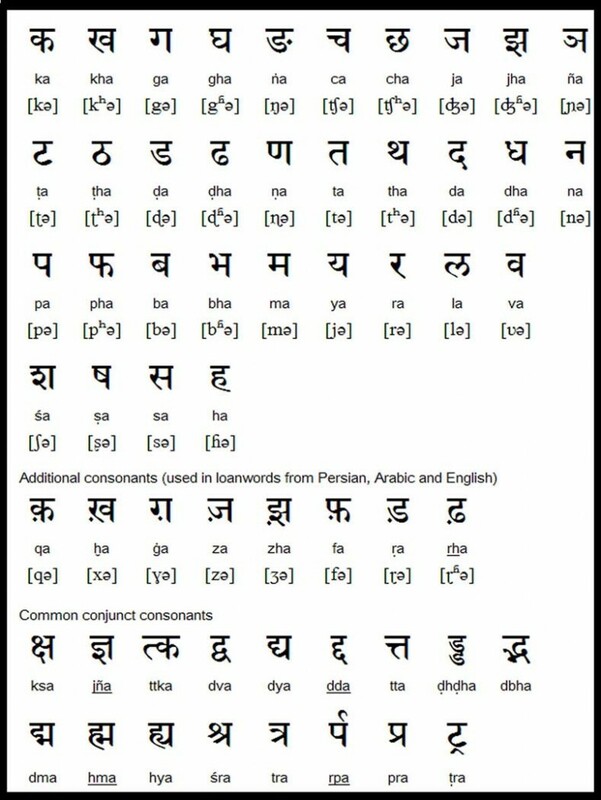 Apart from the difference in writing systems, the other main difference between Hindi and Urdu is that Hindi contains more vocabulary from Sanskrit, while Urdu contains more vocabulary from Persian. At an informal spoken level there are few significant differences between Urdu and Hindi and they could be considered varieties a single language. Hindi first started to be used in writing during the 4th century AD. It was originally written with the Brahmi script but since the 11th century AD it has been written with the Devan?gar? alphabet. The first printed book in Hindi was John Gilchrist’s Grammar of the Hindoostanee Language which was published in 1796. Sarbh? manu?y?n? k? gaurav aur adhik?r?n? k? m?mal? m?n? janmaj?t svatantrat? aur sam?nat? pr?pt hai. Unh?n? buddhi aur antar?tm? k? d?n pr?pt hai aur paraspar un?n? bh??c?r? k? bh?v s? bart?v karan? c?hiy?. Thanks to Arvind Iyengar for providing the above sample text. Very right with the help of relation and connection in north and central part of India, Urdu and Hindi developed and it became the national language of Pakistan and India and maximum people speak Urdu in Pakistan and Hindi in India because of the rural and urban impression on these two languages and it is very difficult to separate these two languages from the mind, heart and feeling of the residing mob of both countries and importance of these two languages are not by becoming the national language but because of its relation and attachment and connection from the hidden source of real feeling from their own ideas for the developing of nation, areas, society, industries, education, science, technology, agriculture, means of transport and communication with the development of religions, culture, civilization, need and style of tradition, food, dress, way of living manner for the showing the countries of the world as a very nice and inviting them to see and know for understanding the habit of living, working, dancing, playing, working, acting, mentioning rightly with very frank manner for the becoming poetic, dramatic, lesson wise teaching for the knowing a well towards the not forgetting the level of two countries due to the effect of these languages, sir. Thank you so much for your comments. It is nice of you to give me some more knowledge about the Urdu and Hindi languages. My Peace poem “Peace Comes to You” was translated into Hindi by Hetal Patel. I was grateful for her spending time to translate for me. 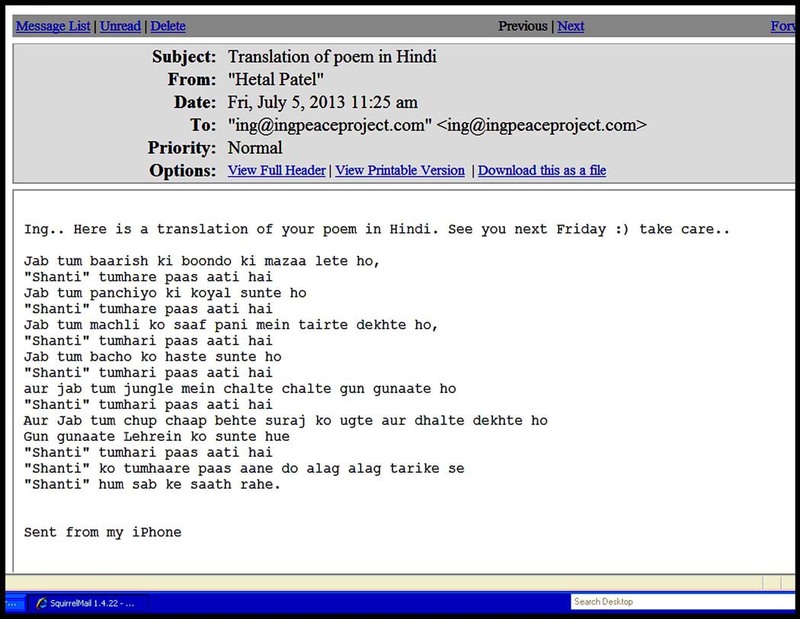 I wish I can have my Peace poem written in Hindi script. For some reasons I cannot get the script writing from her. So I always look for any one who can help me to write in the Hindi script. 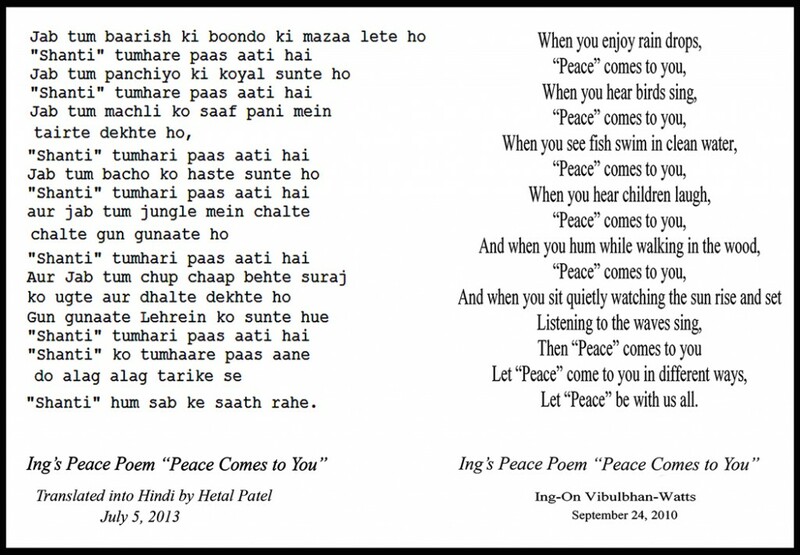 I would appreciate very much if you or someone that you know can write my peace poem in the Hindi script.